Other than being an brilliant and renowned filmmaker (All About My Mother; Talk to Her; Bad Education; Women on the Verge of a Nervous Breakdown), Pedro Almodovar just made these comments, which makes me love him even more. 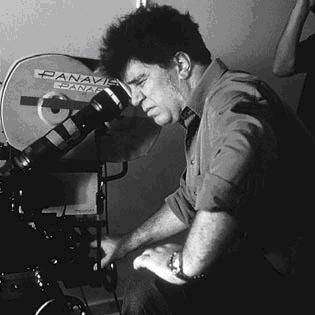 Director Pedro Almodovar has crushed speculation he plans to quit his native Spain for Hollywood. The maverick moviemaker, responsible for films such as Volver and Bad Education, feels he is too old now to change his ways and that the Hollywood method of working would not suit him. I love him! His films typically center around women and their relationships. (Plus if there is one reason why I take Penelope Cruz seriously, it’s because of his movies). Also, if there is anyone who understands and appreciates good screenwriting, it’s Pedro Almodovar. In 2003, he won the Best Original Screenplay Academy Award for Talk to Her, not to mention the Best Screenplay Award he picked up at this year’s Cannes Festival for his next feature, Volver. Volver, starring Penelope Cruz, releases in the US on Novemeber 3. It’s already generating major buzz, with Almodovar, Cruz, and the film possibly receiving nominations. I can’t wait. I like that he cares about the script so much, but I don’t think it is the most important part of the film. I love a good script, but to me, film is about the visual element involved; telling a story visually. I think the best directors use a perfect balance of script and visuals, like Robert Altman or Alfred Hitchcock. I think the script is the most important part of a film. It’s the foundation of a good movie. The technical skills and visual elements are all things that the director derives from their interpretation of the script. There just can’t be a movie without it.